What makes the perfect prom updo hair styles stand out from the rest? It has to be totally up-to-the-minute fashion-wise and a style that suits your personality. In addition, you should choose a style that will be comfortable and cool, if you plan to dance all night. From one-off, temporary pastel colors painted on a semi-formal, prom updo to super-chic, hair-knots on blonde, brunette, red, violet and gray hair, these 10 looks are full of fab style inspiration. 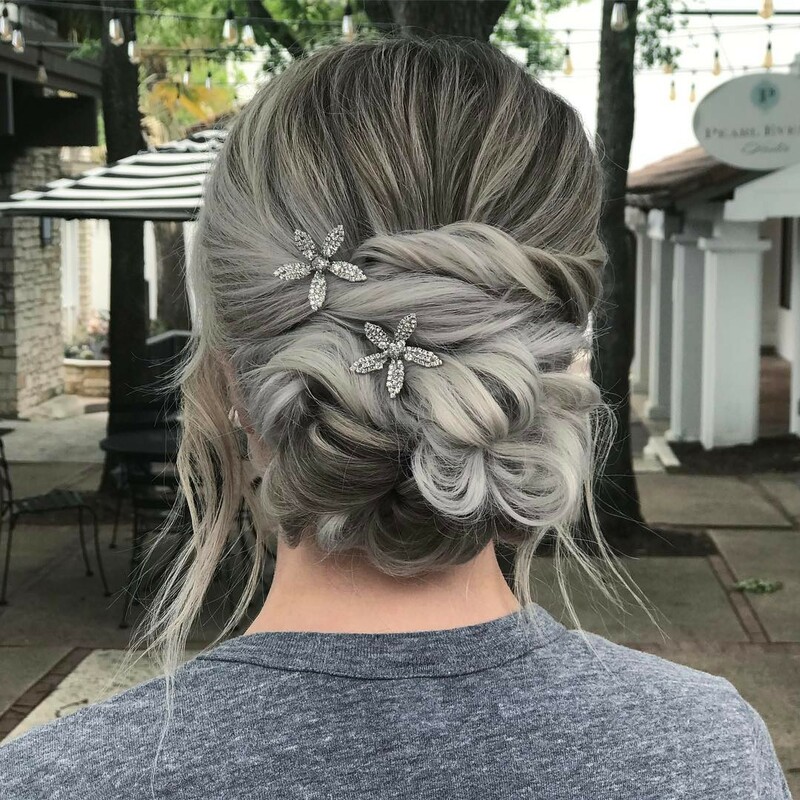 So dip into this season’s top prom updo hair styles to see a range of fresh ideas and choose your best prom hairstyle ever! Knotted updo hair styles always look extra-classy and this asymmetrical updo has a very sophisticated look. 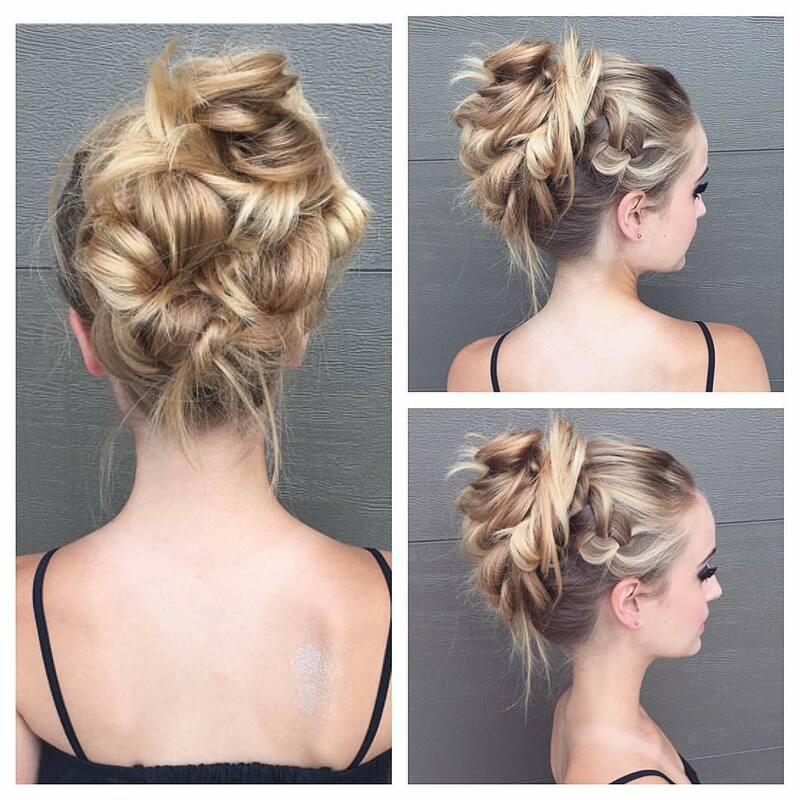 This style has approximately 4 different blonde shades all woven together to make a beautifully blended updo. 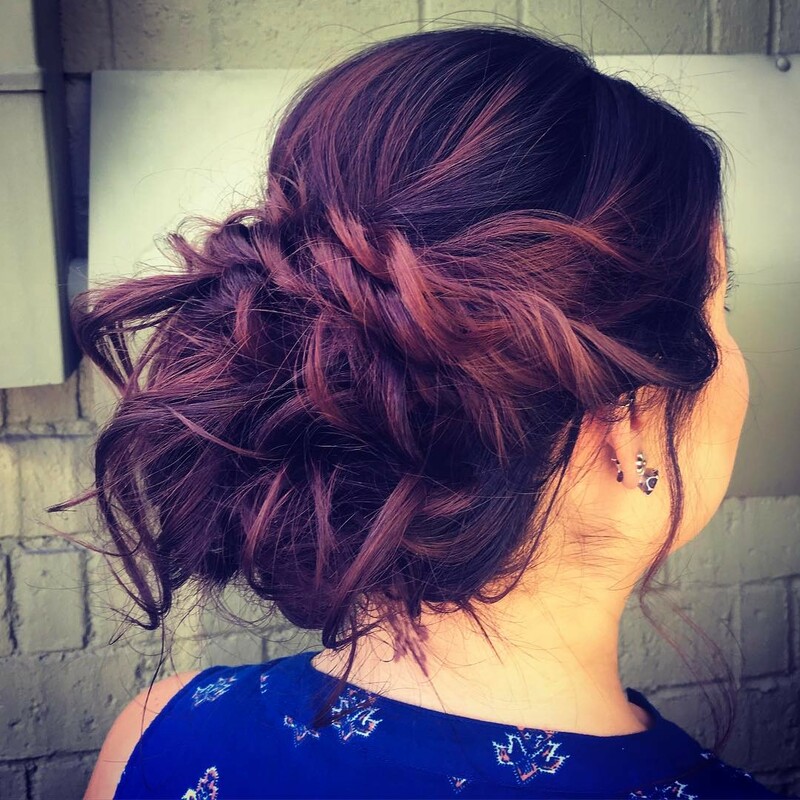 You can get this updo on long hair that has blonde balayage and ombré in the latest neutral beige and ash-blonde blonde hair colors. 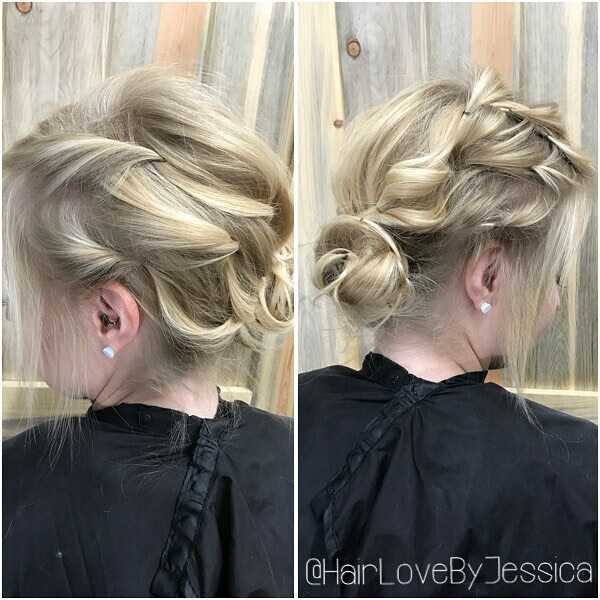 Neutral beige blonde gives a youthful and more natural look to a fabulous prom updo that’s fresh and not too formal for having fun! Here’s a very new updo hairstyle because long, gray hair is unusual at any end-of-year dance. But today’s fashion for gray and ash-blonde hair-color means it’s not only the mature members of the faculty who’ll have gray hair at the prom! 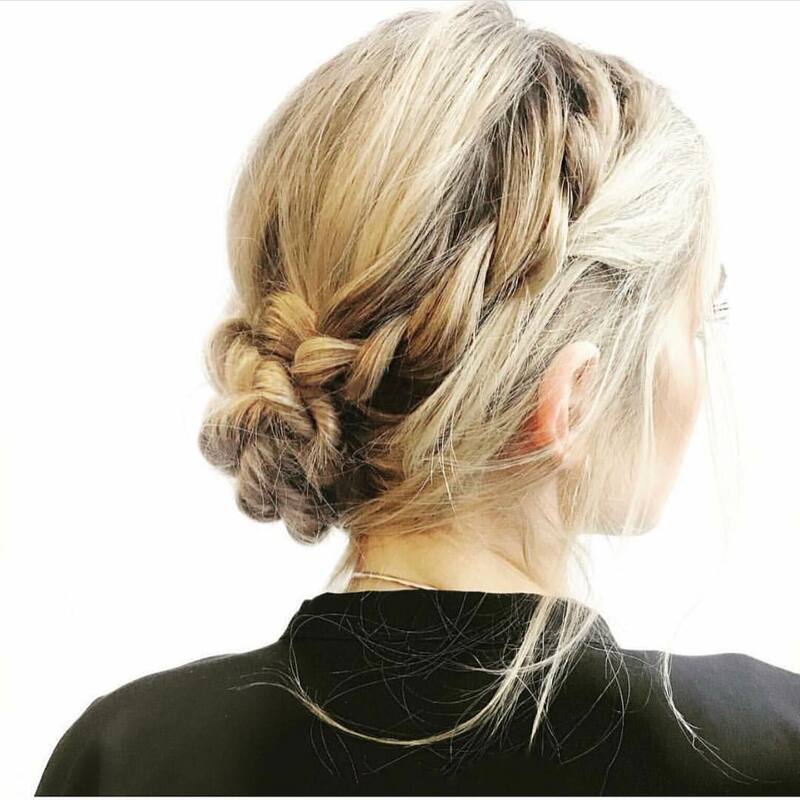 This semi-formal updo mixes hair twists and knots in a new way, showing-off a lovely ash-blonde balayage and ombré on black hair. Loose side-sections in beige-blonde casually frame the face and the pretty diamanté hair accessories add a very fashionable final touch! 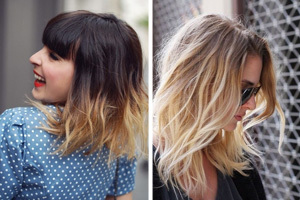 If you prefer a less formal look, maybe this messy blonde mix of color and texture is just what you need. The model’s long hair has several different blonde shades, with neutral blonde in the roots and around the head. Lower down, the hair is golden-blonde in a delicious honey toned balayage/ombré technique. These colors make beautiful patterns in the trendy, flat head-braid decorating the sides. The twisted chignon is placed just below the crown and ends a couple of inches above the nape. A clear nape means you won’t get too hot and helps keep you looking cool in the excitement of a prom! There’s nothing messy about this well-coiffed prom hairstyle, suitable for a sophisticated beauty look! 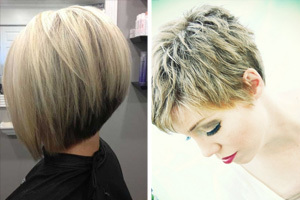 Warm medium-brown hair has been very subtly highlighted with light golden-brown to accentuate the hair’s natural shine. The braids are plaited under, rather than over, in a well-groomed and soft-edged pattern that creates curved volume around the head. The hair has a very classy medium-blonde balayage/ombré with warm hints of copper-beige and touches of mid-ash-blonde. And the softly curved ‘hair-knot’ chignon at the nape makes this a very regal prom updo! 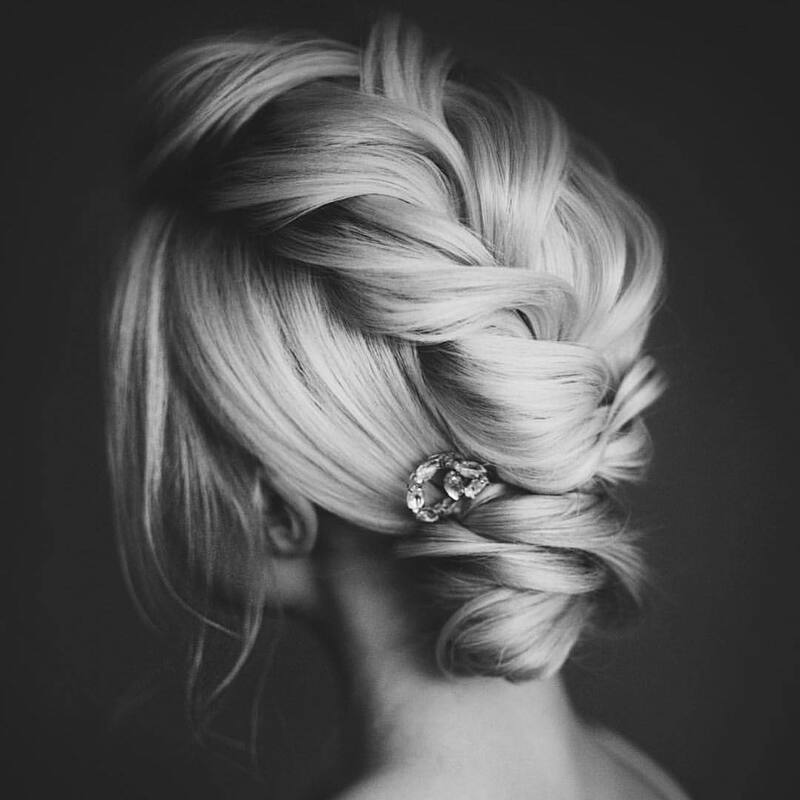 Of course, you don’t have to have extra-long hair to get a gorgeous prom updo, as this image demonstrates! 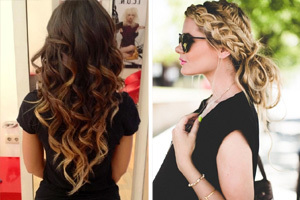 The stylist has created a very attractive loose braid ‘effect’, which is actually an illusion. The layers are over-lapped and then fixed with hidden hair-grips, with a cute little hair-knot at the nape. The pretty jewellry hair accessory adds an extra touch of class, and loose side-strands add a casual vibe. This lovely prom updo hair-style can be achieved on hair of any color that’s chin length or longer! You can see that the colorist has taken inspiration from the cute pastel colors in the flowery cape worn by the model! The result is a playful, extra-special prom hairstyle that will give you some great photos. The roots are medium-beige and the white-blonde gleams from the pearly finish. But the stars of this ultra-modern, prom hairstyle are the delicate honey, pink, gray and blue tones that will take everyone by surprise! 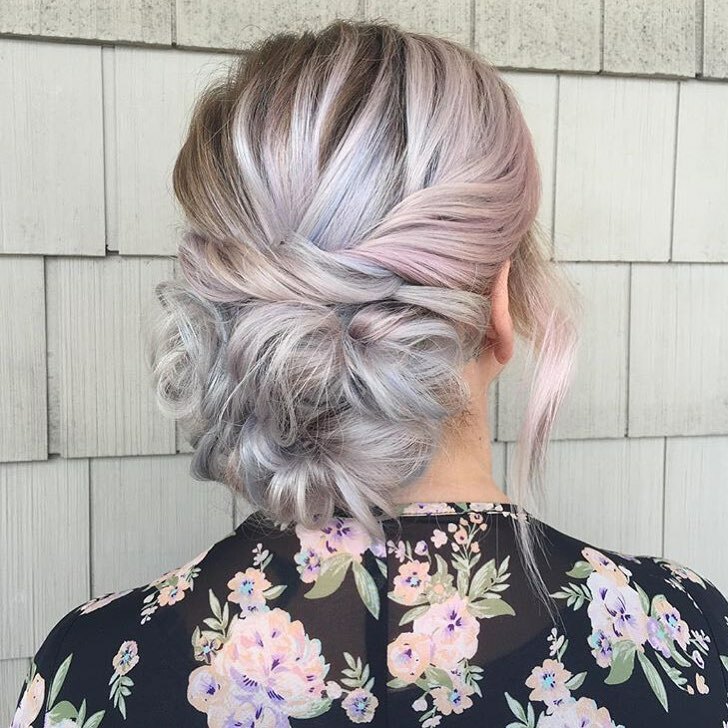 The look is a subtle ‘fantasy’ color design, with ash-tones creating muted pastels on a gorgeous, twist and knot low chignon. 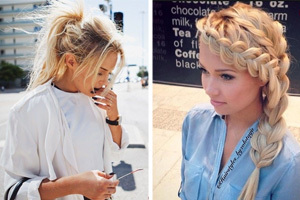 This is a casual look that takes inspiration from the traditional braid hairstyles of the 19th century. It’s usually associated with the flaxen-haired milkmaids of the past, but it looks just as attractive on black, brown and red hair. There’s a casual, two-strand twist instead of a neatly plaited head-braid moving down and around the head, with lots of loose strands. This creates a blurred line and an ‘undone’ finish. The twisted hair rosette makes a cute, multi-toned hair-knot that’s asymmetrical and clear of the nape, for a modern look . 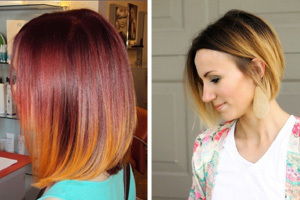 As you can see, you get marvellous blends of color if you create this style on hair with balayage/ombré highlights! This extravagant version of the fauxhawk creates a line of rolled and twisted hair from crown to the nape. 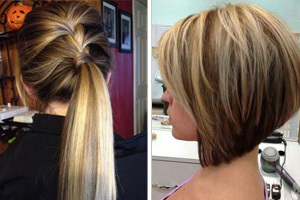 You get the impression of very long hair, but it’s another clever hairdressing illusion! This semi-formal prom hairstyle can be copied on hair that’s medium-length, between the chin and just brushing the shoulders. And another factor creating the impression of thick, long hair is the strong contrast between coffee-brown roots and pale blonde balayage around the face. This contrast makes a 3-D boost for color-depth and density. And with warm brown lowlights around the tips, the result is full of lively texture and movement! Topped off with a cute, diamanté hair clip – you’re good to go! Thick or coarse straight hair is perfect for creating free-form prom updo hairstyles, because of the built-in volume. And if you really want to show-off your Bohemian style, why not copy this deep purple and coral-blonde color design, too! This style has added height around the crown above the popular twisted hair strands fixed horizontally across the back. And beneath that line is a gorgeous mass of teased hair lightly shaped and pinned into a fabulously unconventional updo! This is also a prom updo hair-style you can get on medium-length hair. 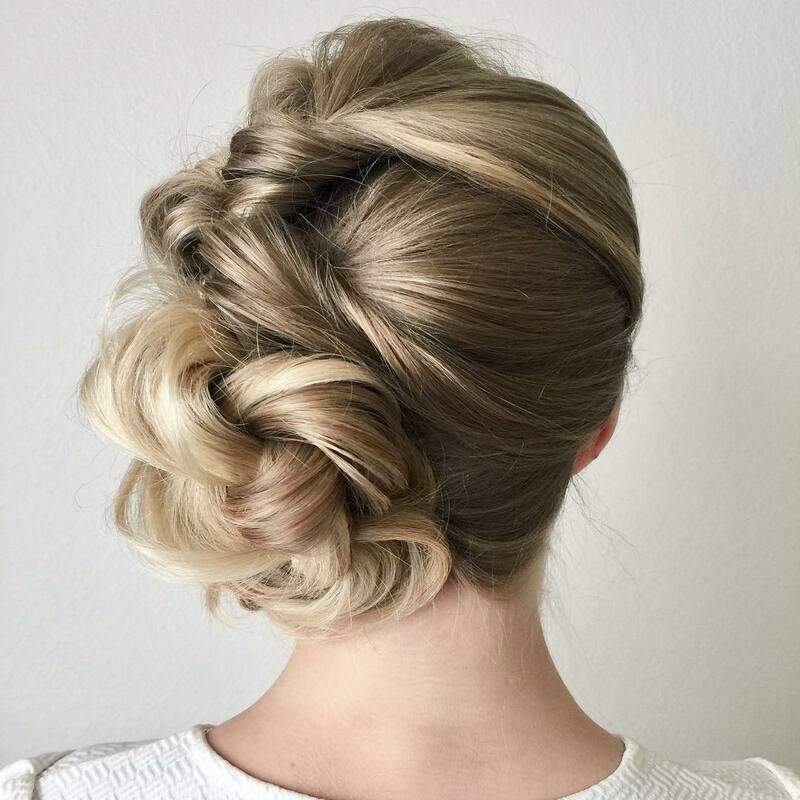 This naturally blonde prom hairstyle shows how to give fair hair a little boost from dual-blonde balayage. Beige and ash-blonde shades are nearer to natural blonde colors, so they do a great job of ‘enhancing’ dirty-blonde or mousey hair. You can see that the model’s silky-textured hair hasn’t been spoilt with even a hint of over-bleaching. 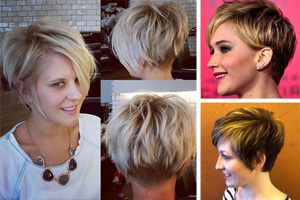 This style avoids the bouffant volume suitable for older teens. But has attractive volume, texture and pattern added simply, by pinning waves to the head. The swirly, asymmetric chignon is modern and fashionable, with loose strands softening the profile. And the ‘undone’ vibe makes this a charming and natural look for a teen prom!